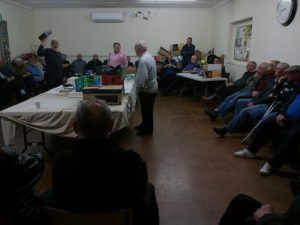 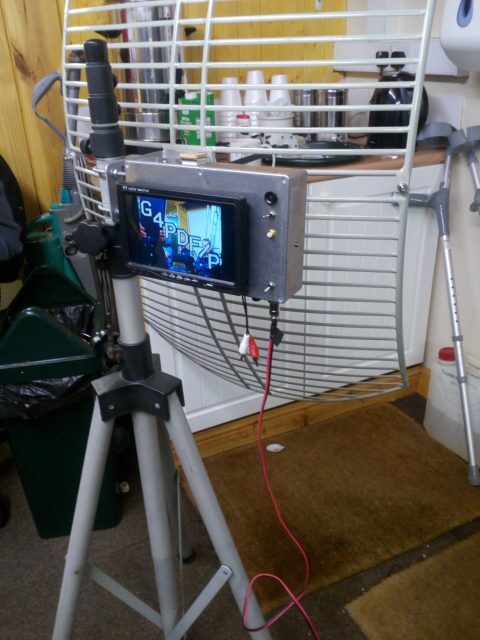 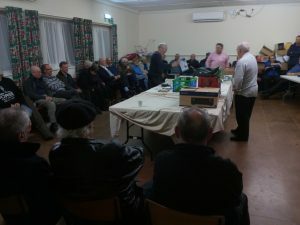 On the 28th November we were treated to a talk on Amateur Satellites by Stephen 2E0SSM. 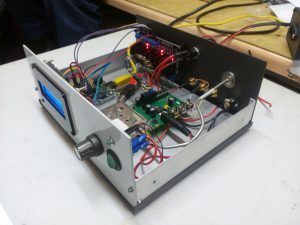 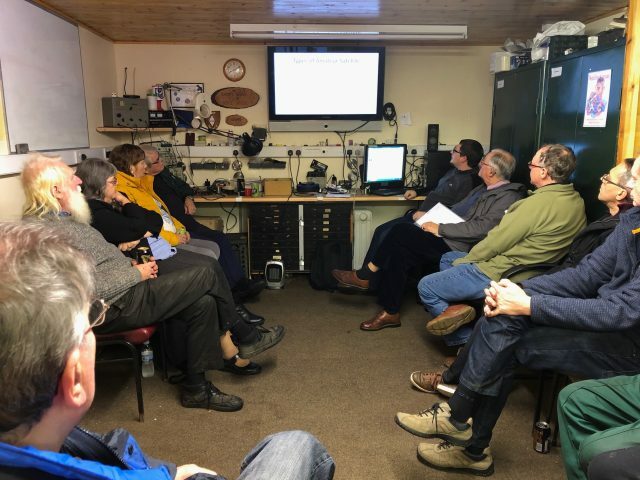 He started by talking about the different types of orbits in use by all satellites and then moved onto the more specific orbits and the various types of satellite that amateur radio uses. 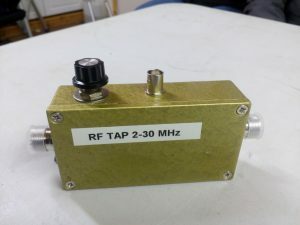 A look at antenna’s and the effects of doppler shift leading to the need to correct frequencies followed. Stephen also gave information on which frequencies to listen on and some very useful websites for those of us who wanted to try it out for ourselves. 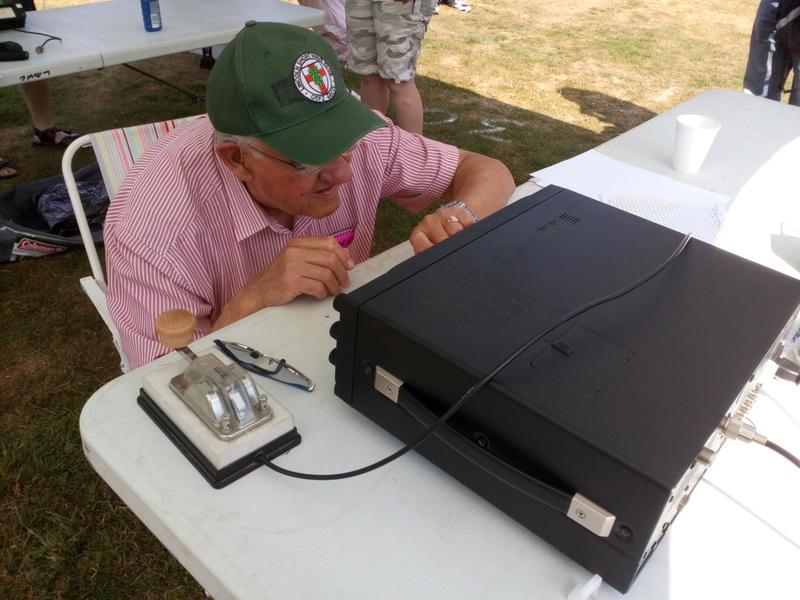 The talk was very well received and Stephen gave a demonstration after the talk using the equipment in the club radio shack. 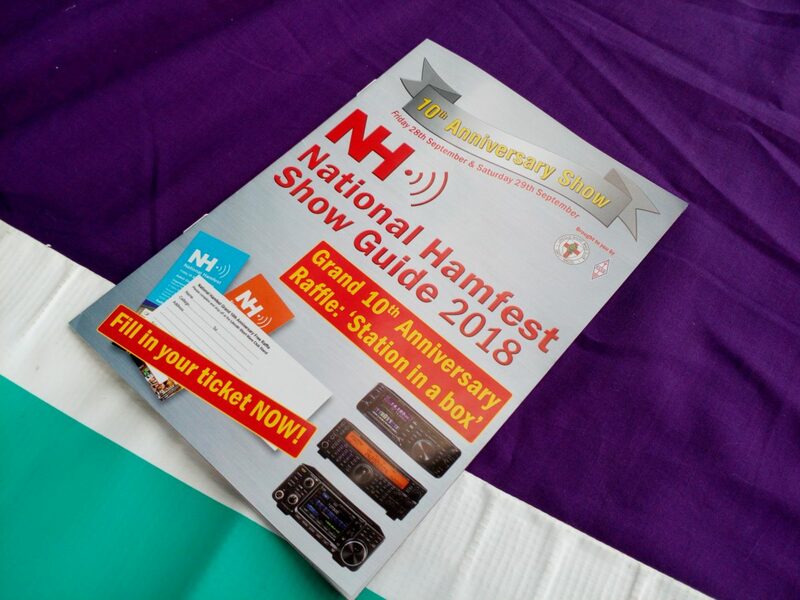 10th Anniversary of the National Hamfest. 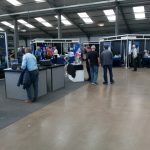 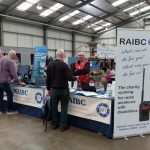 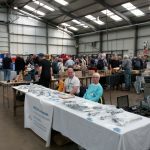 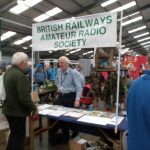 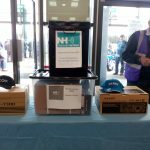 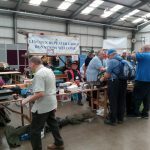 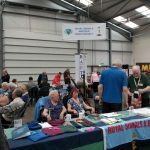 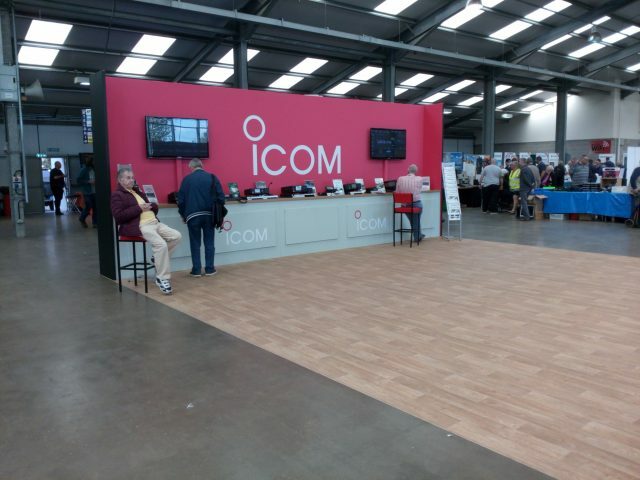 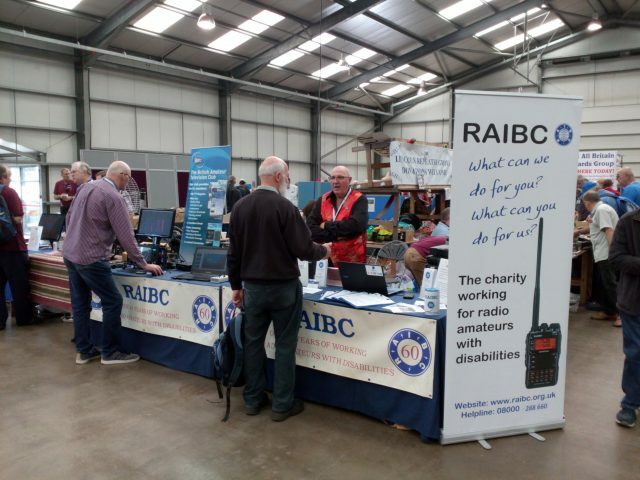 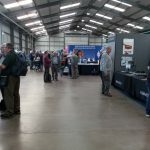 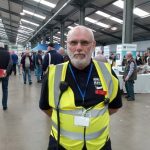 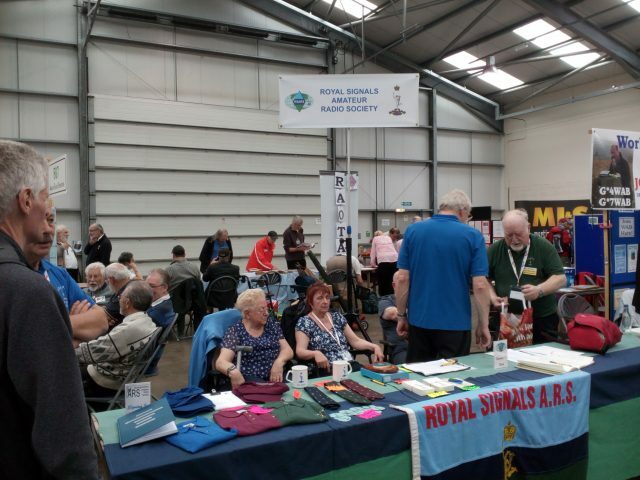 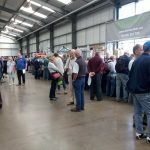 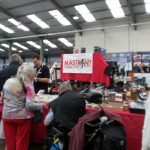 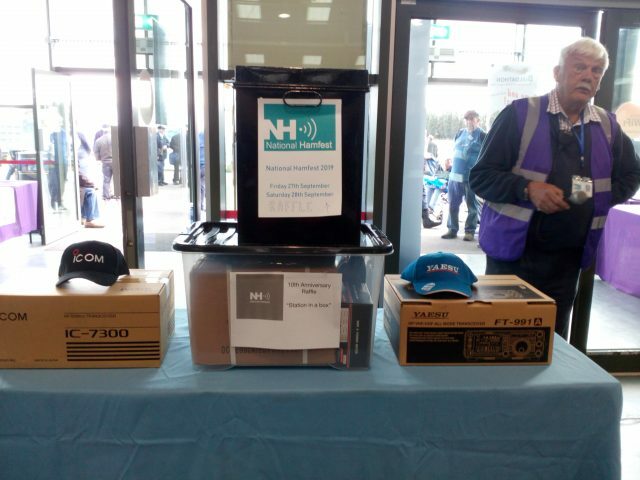 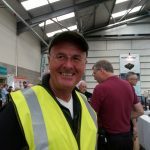 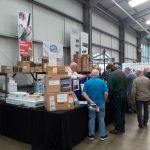 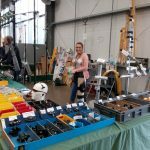 Record numbers attended this year’s National Hamfest which was held on the 28th and 29th September. 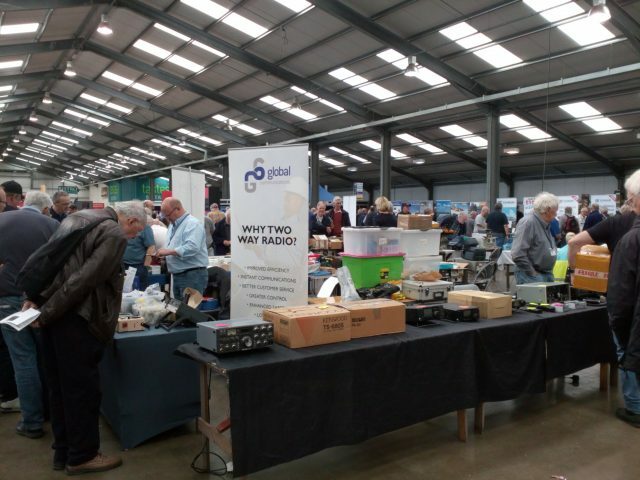 The George Stephenson Hall was filled with traders from around the UK and Europe together with Clubs and Special Interest Groups and RSGB Books and RSGB Committees. 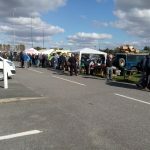 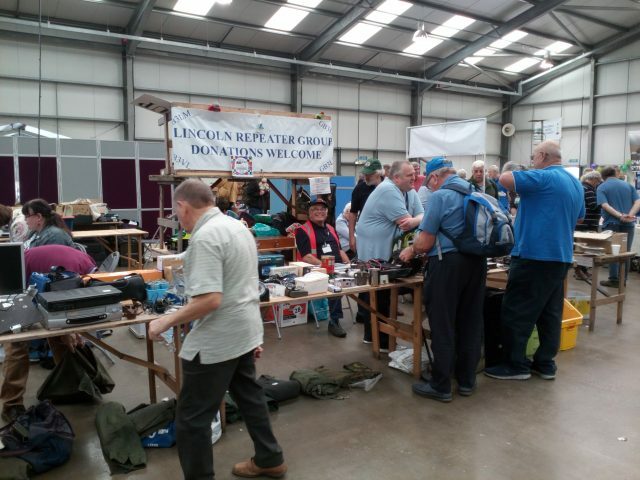 There was a large flea market area and outside traders together with the Bring and Buy marquee and Camb Hams with Flossie running GB18NH. 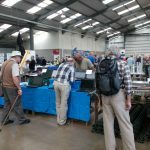 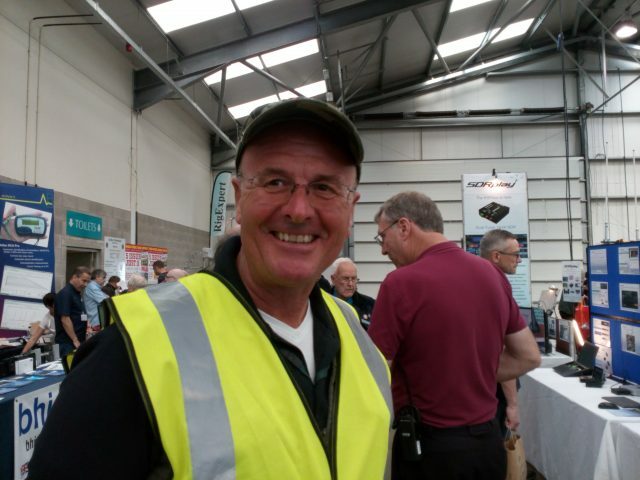 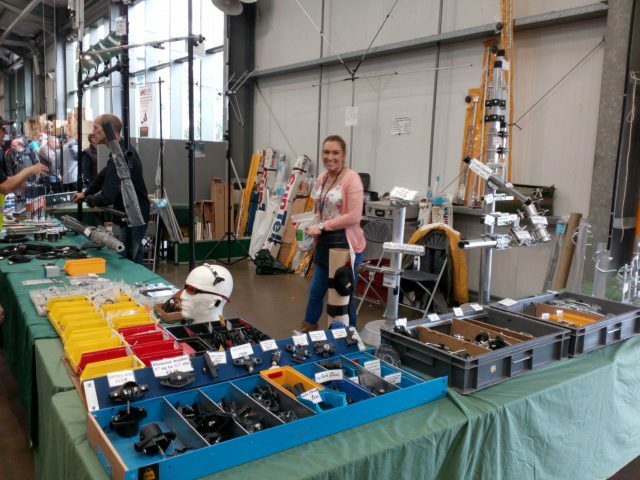 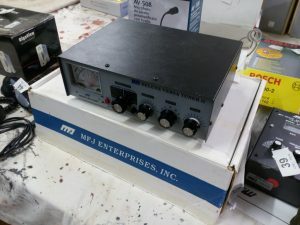 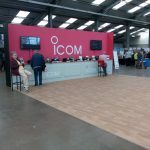 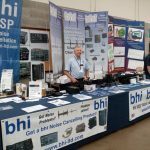 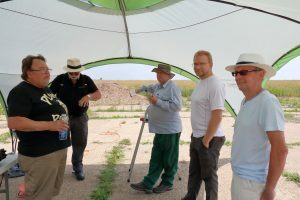 Below are a few photos to remind you of this year’s Hamfest or to show you what you missed. 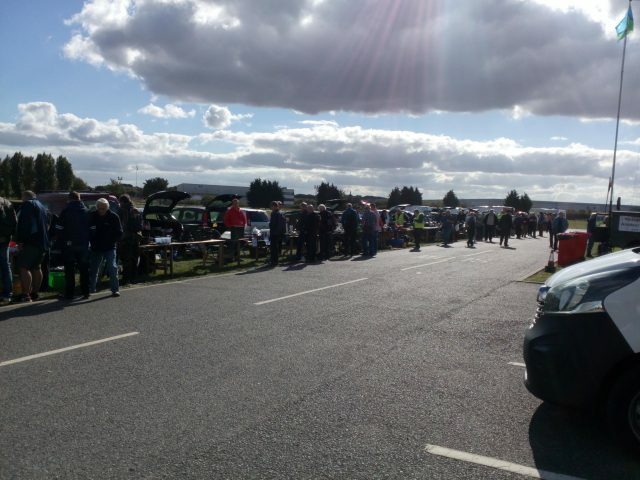 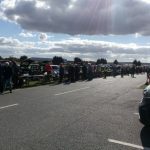 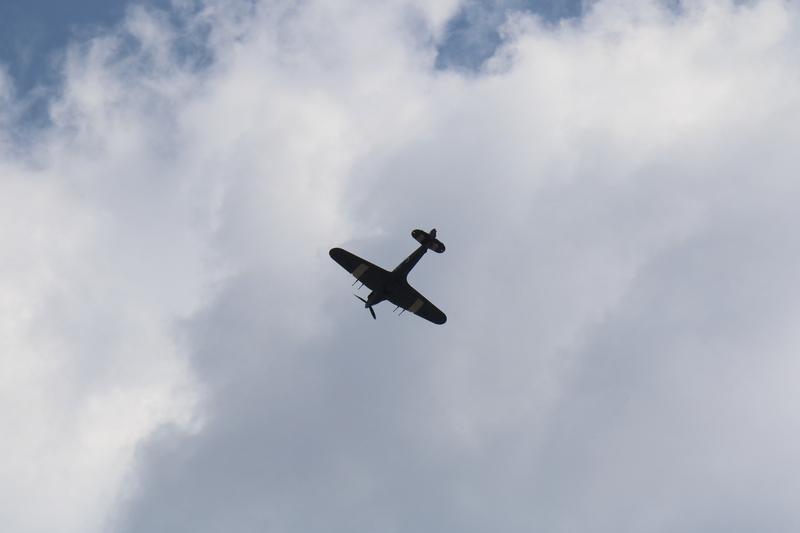 LSWC was once again at the FirPark Wings & Wheels event. The Club was there from Friday afternoon through to Monday evening of the August Bank holiday weekend. 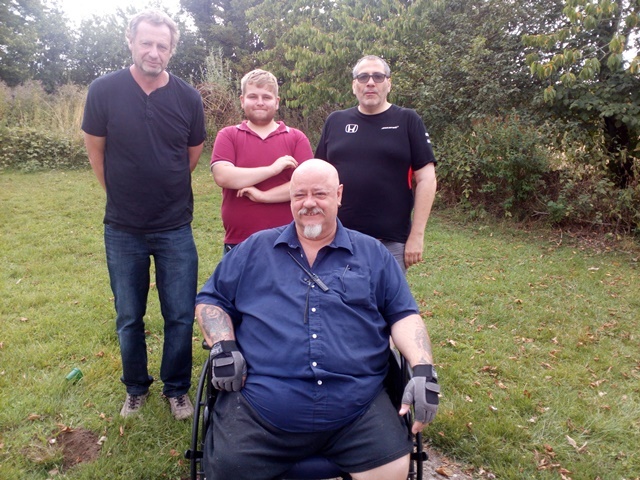 Friday afternoon Les G1LQB, Peter 2E0FGA, Stephen 2E0SSM, Steve M5ZZZ set off for FirPark from their various starting locations. 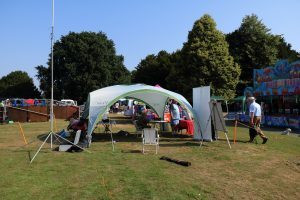 Les arrived first and started setting up and putting the masts up, the great thing about the masts we use are that they are designed to be erected by one person. 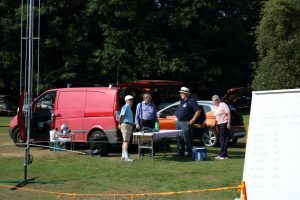 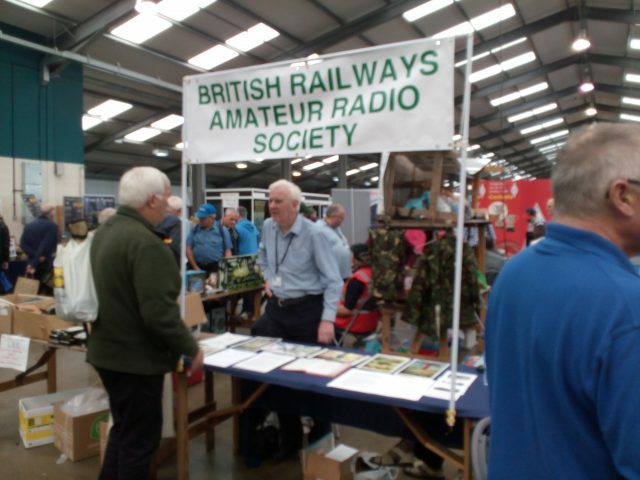 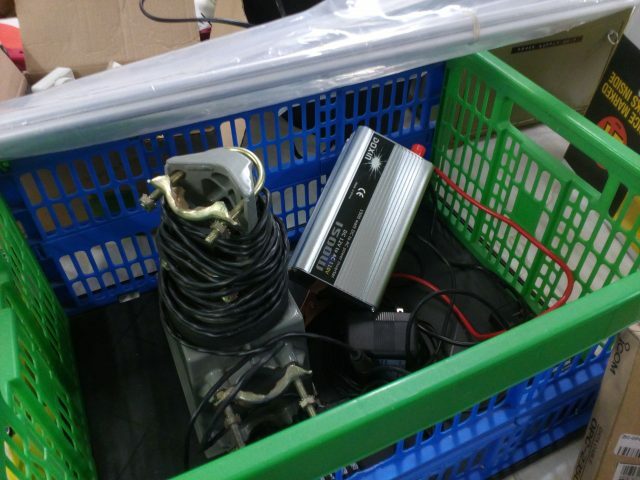 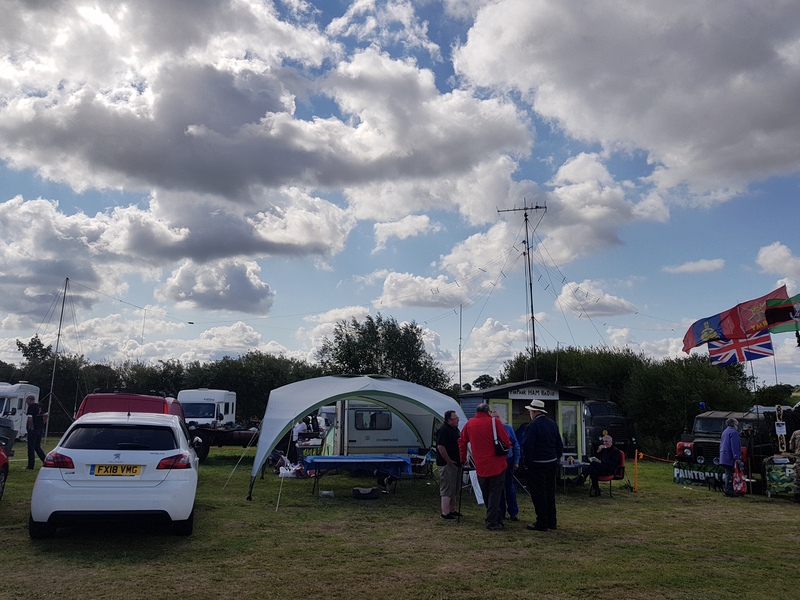 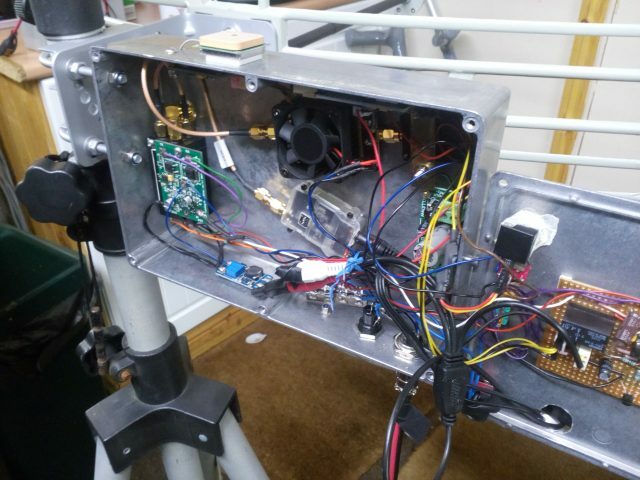 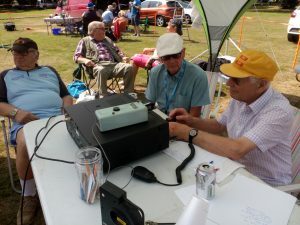 In addition to previous years Steve brought down his 2m / 70cm beam and along with Les’s special rotator, aquired at a previous FirPark event, we had 2m / 70cm SSB available using the icom ic-910. We also had the usual fan dipoles covering all of the HF bands and Les’s X30 collinear for 2m / 70cm FM. 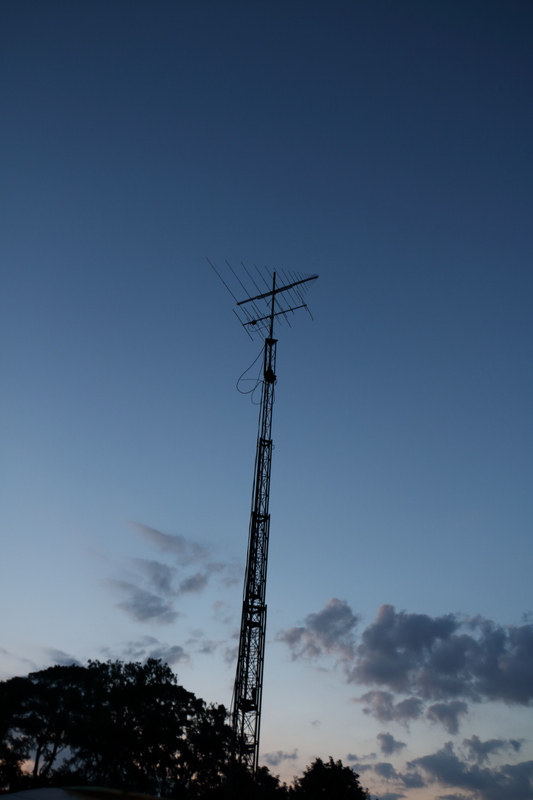 By Night fall on the Friday the antennas were ready to lifted into position in the morning for operation to begin. Saturday morning saw the antennas raised into position and operating began. 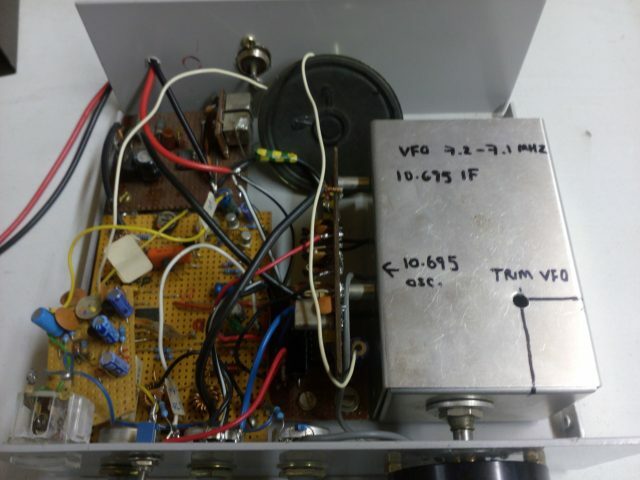 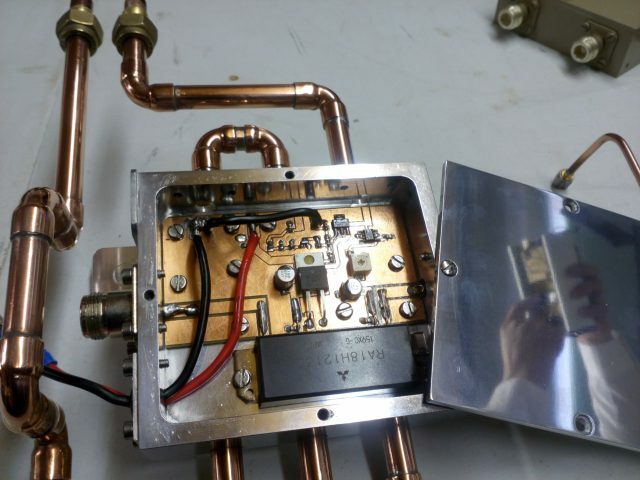 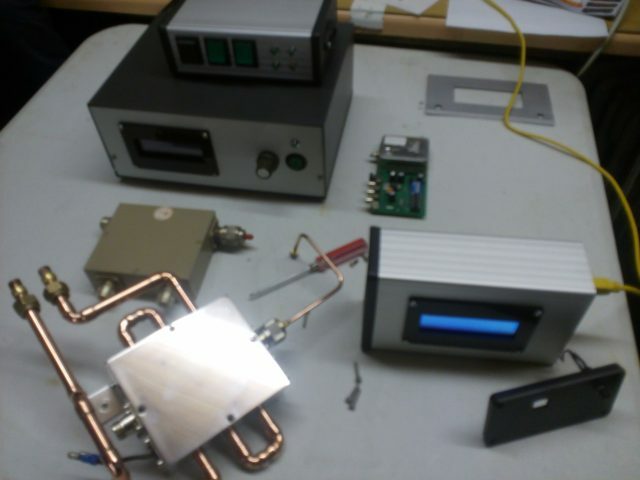 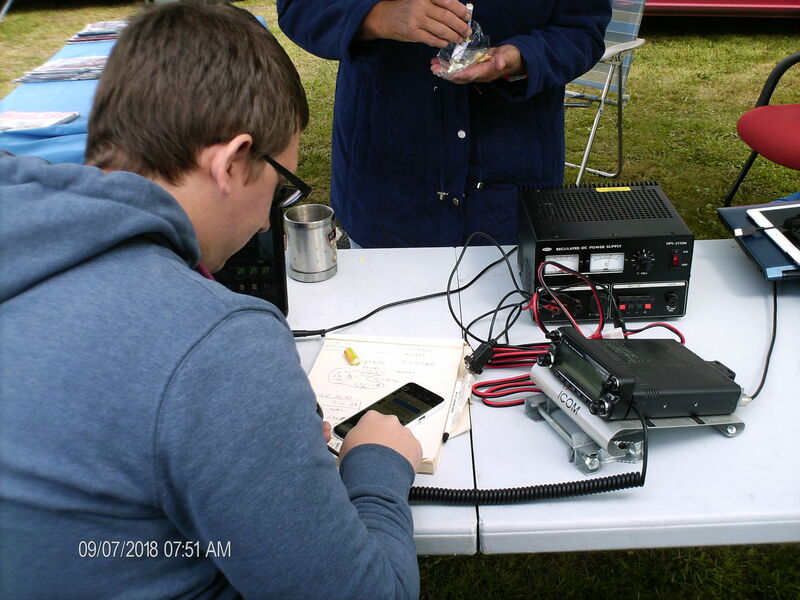 Some contacts were made using various modes, Including CW, FM, Via Satellites and SSB on HF and 2m. One of which being an SSB contact to America. 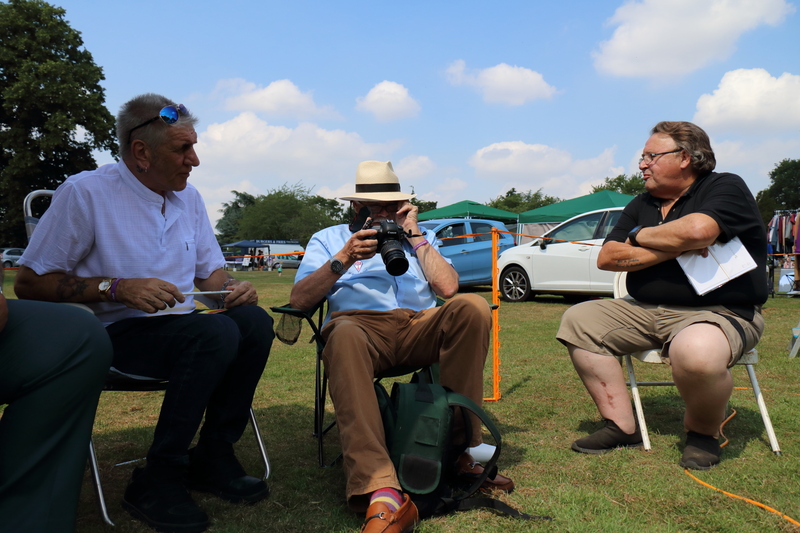 We were also joined by Mick, M6OYP and his dog for the morning. 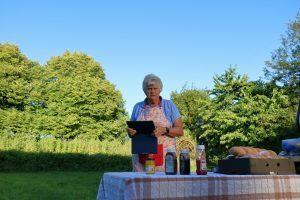 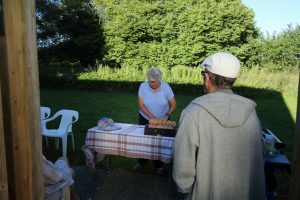 Pam G4STO also joined us and brought with her the usual sausages and burgers, although an unfortunate dog incident occurred with the burgers, and cooked us a late breakfast and then some lunch. 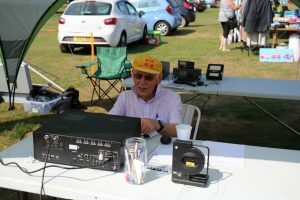 We were also joined by Barry G4DBS who spent some time on the radio. 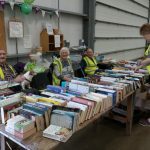 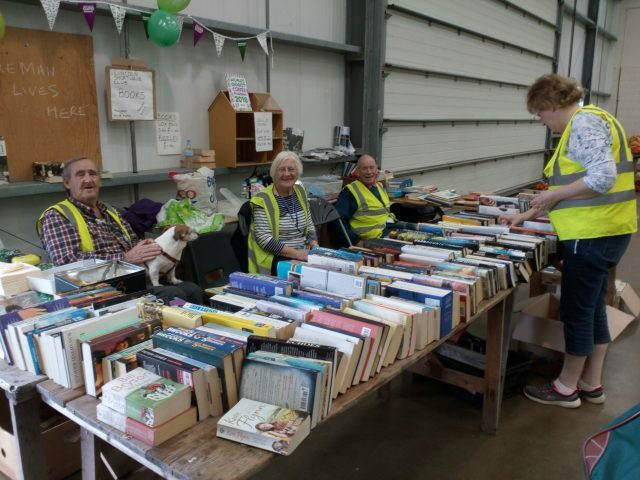 During the day we had a number of people come and speak to us with a couple taking away Foundation books and some magazines. We hope we will hear from them again to do there Foundation licence. 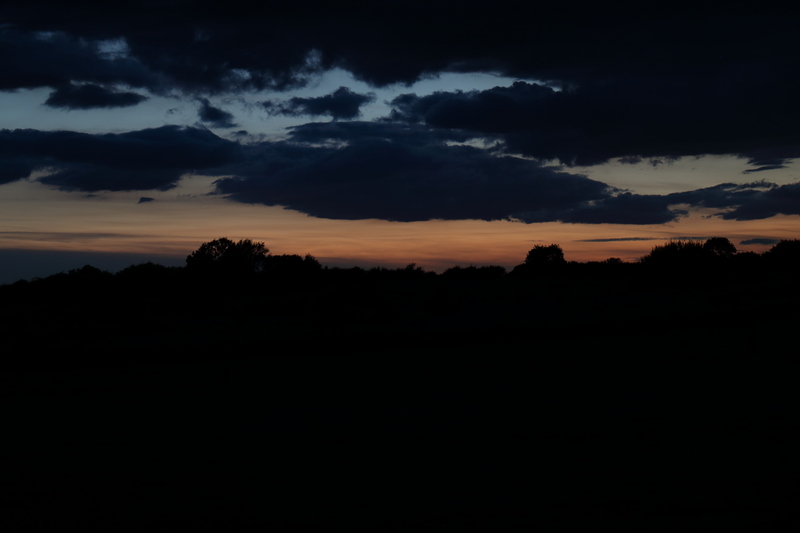 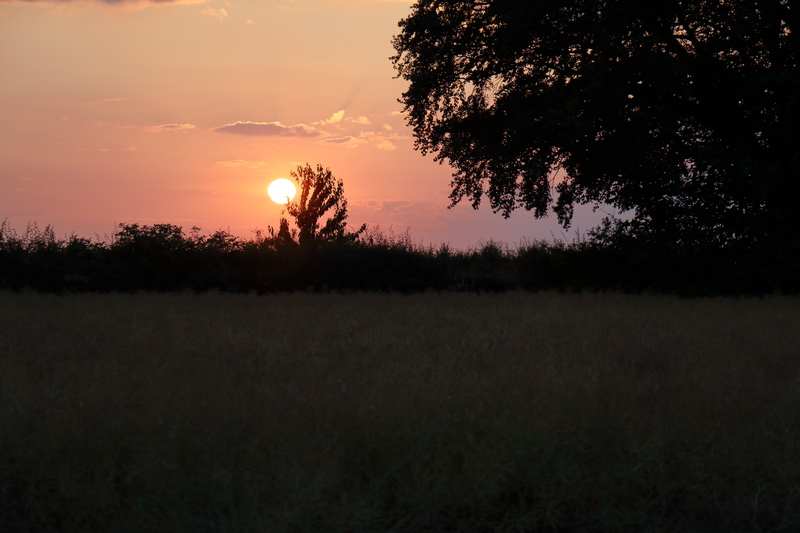 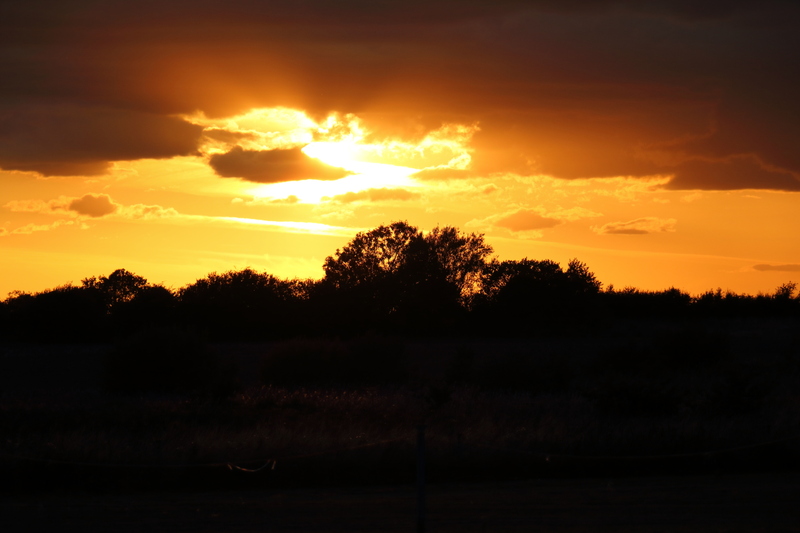 As the day come to an end Les, Stephen and Peter were left to camp over and were treated to a nice sunset. 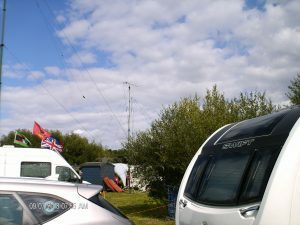 After a chilly night the three campers arose on Sunday morning ready for another day. 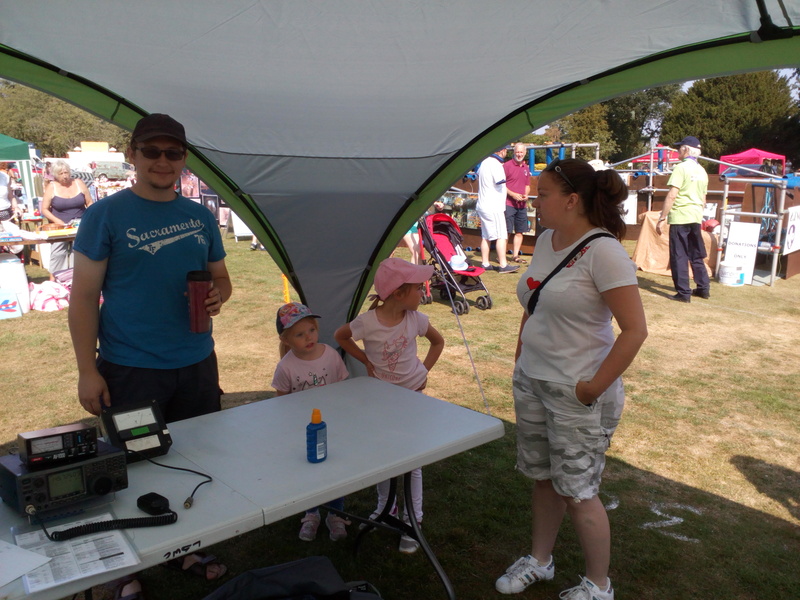 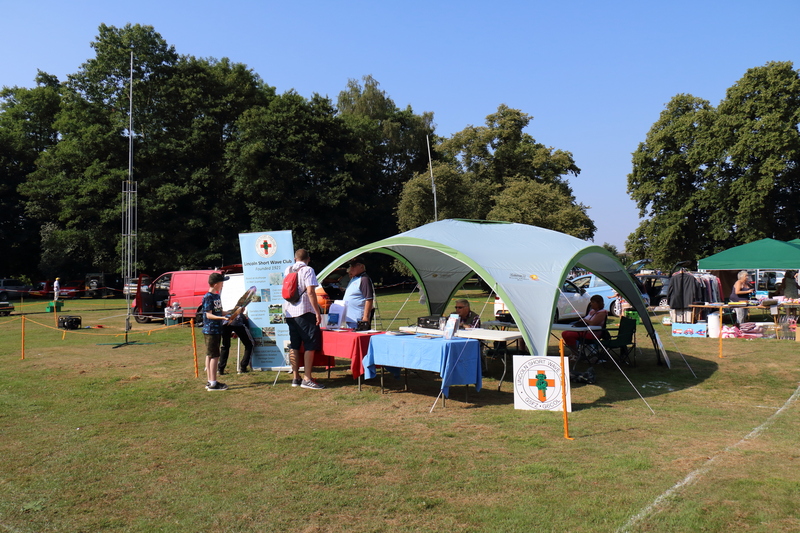 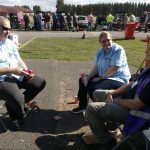 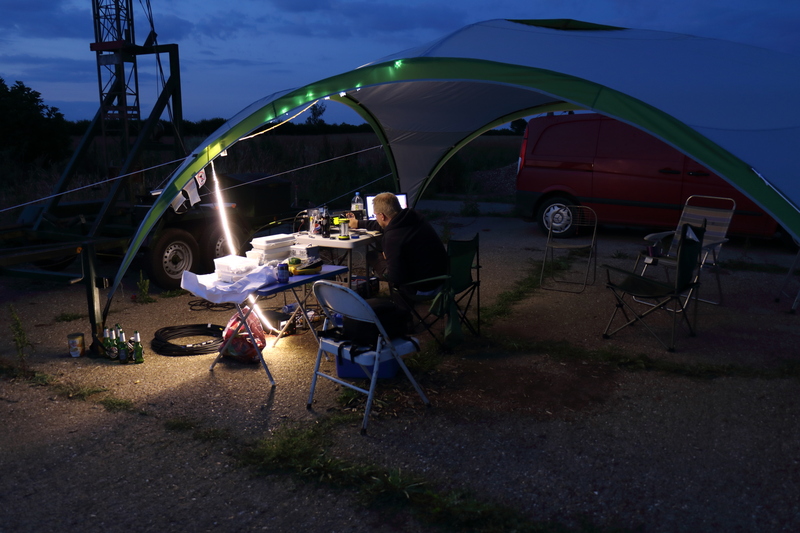 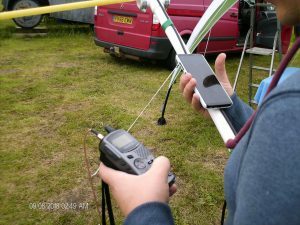 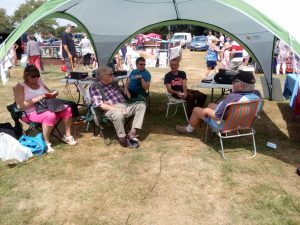 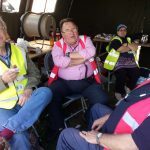 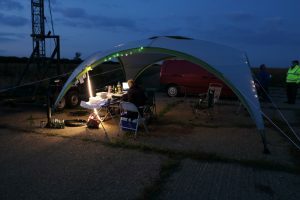 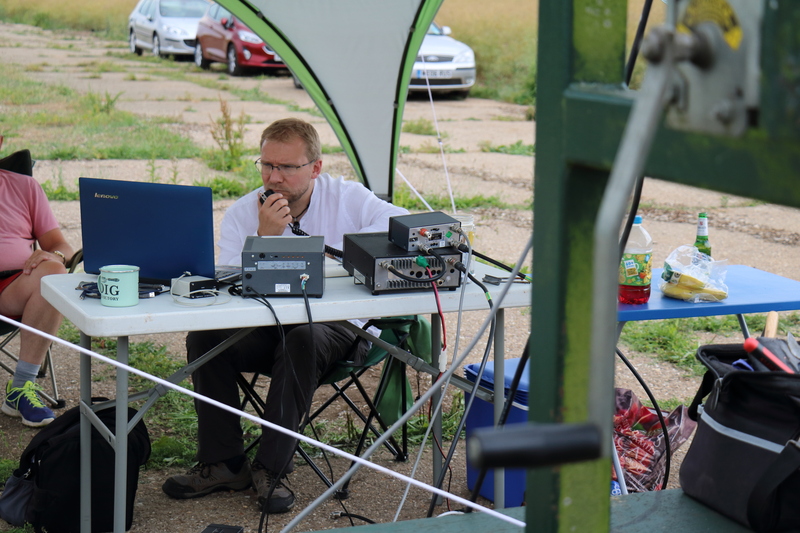 Sunday we were joined by Tom G4OSB, who took up the key on HF making a few contacts in the morning. 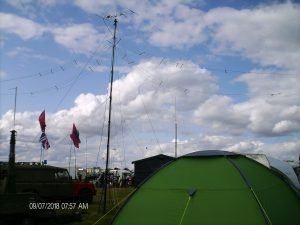 By 11am though the weather had turned and the rain began to fall. 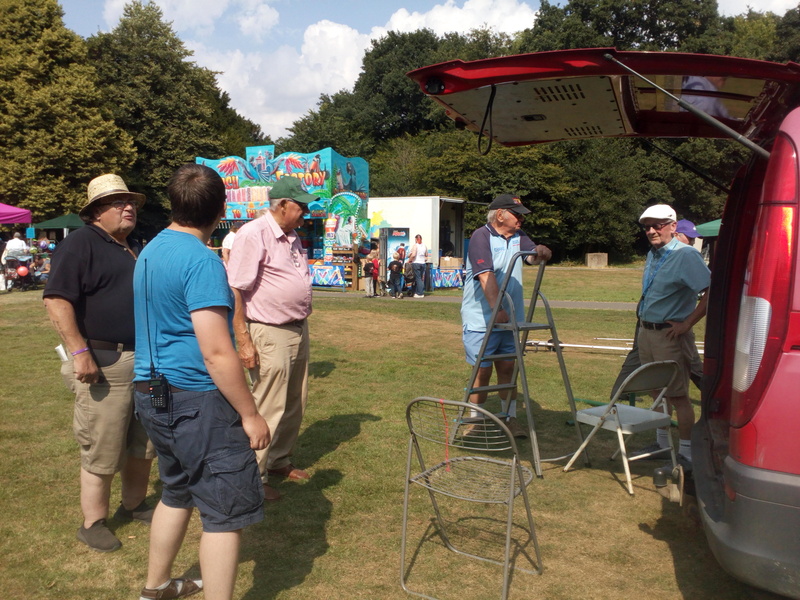 The public had left and some stall holders had packed up and headed for somewhere warmer. 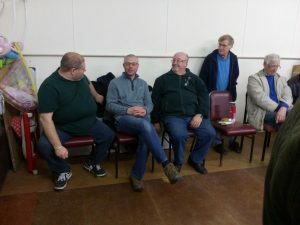 Les, Stephen, Peter, Steve and Tom braved the weather before Tom and Peter had to depart leaving just three to continue. 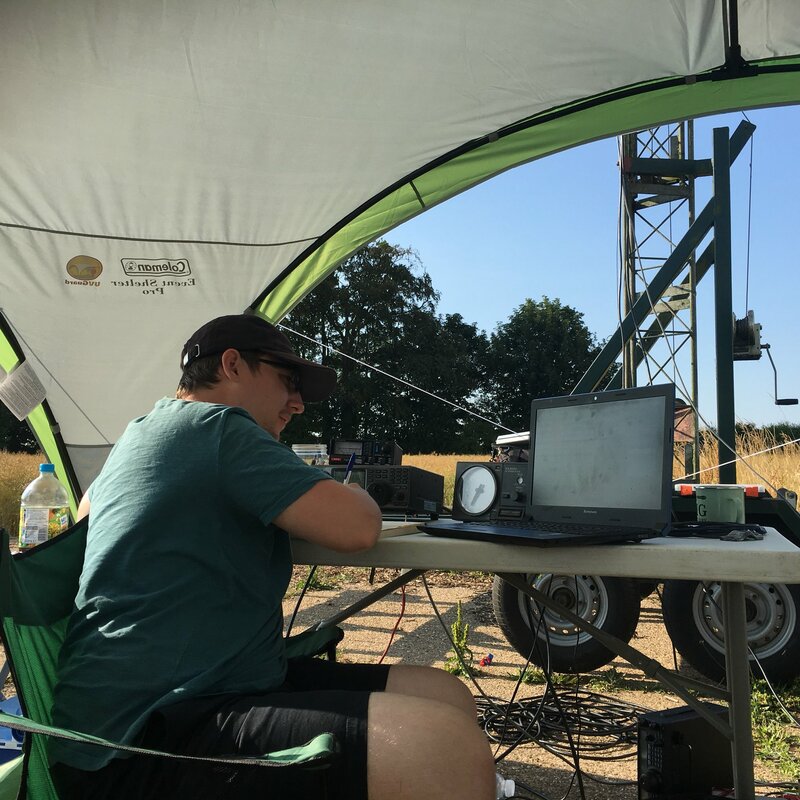 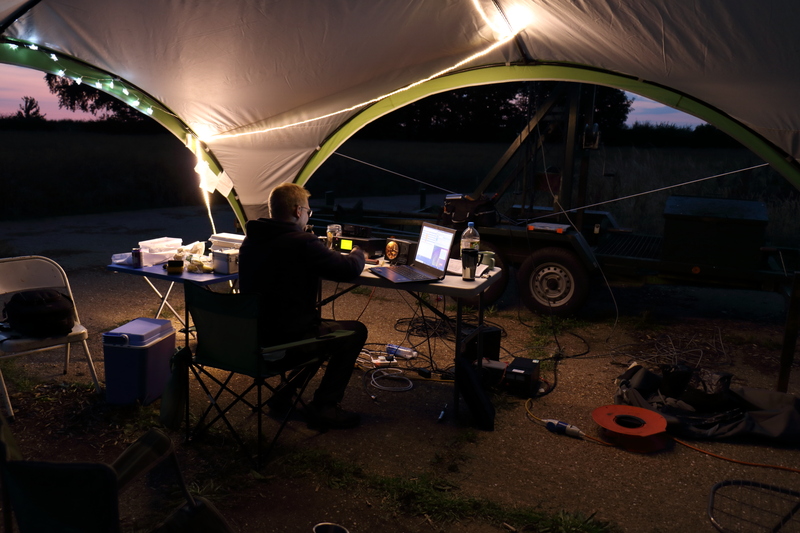 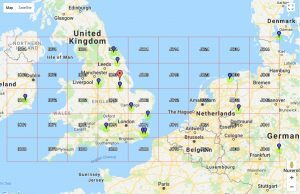 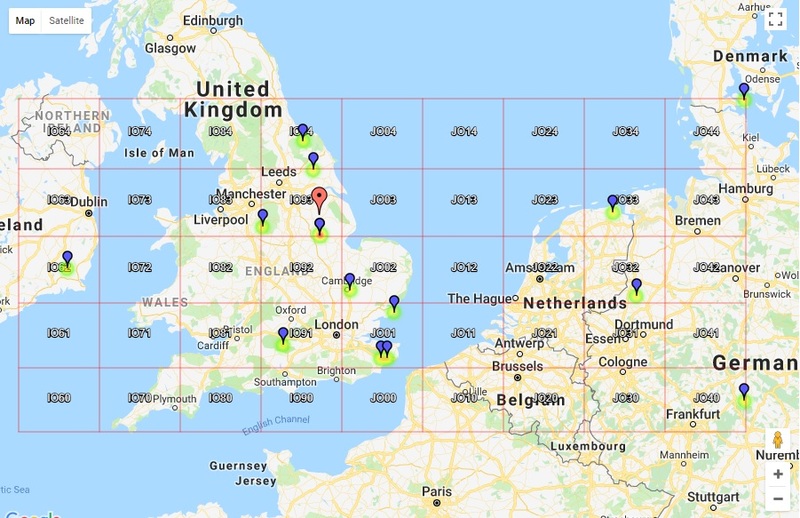 Band conditions started to improve with some good contacts made two of which to other special even stations in other parts of Europe. 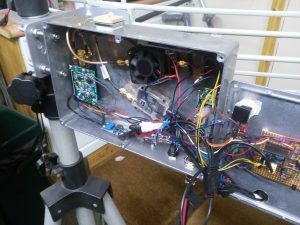 Soon Monday arrived and reading a post on the internet Stephen read that the digipeater on the ISS was surprisingly back up and running. So to see if this was true he got out his Tape measure Yagi and hooked it up to his handheld radio. 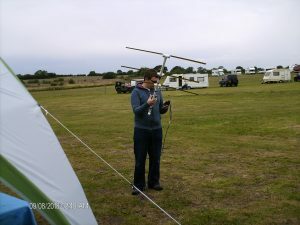 Using the built in TNC / APRS he transmitted the packets not expecting to get a reply. After just his second transmission he got a reply back acknowledging his message and once the pass had finished he checked the received calls log on the internet and was delighted to see his callsign listed. 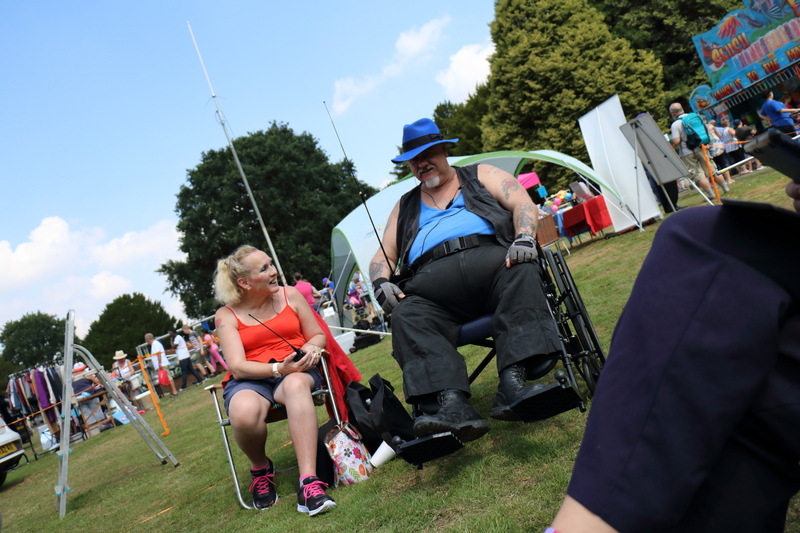 As the day went on we were joined for a brief period by Roger G3PVU & Jackie. 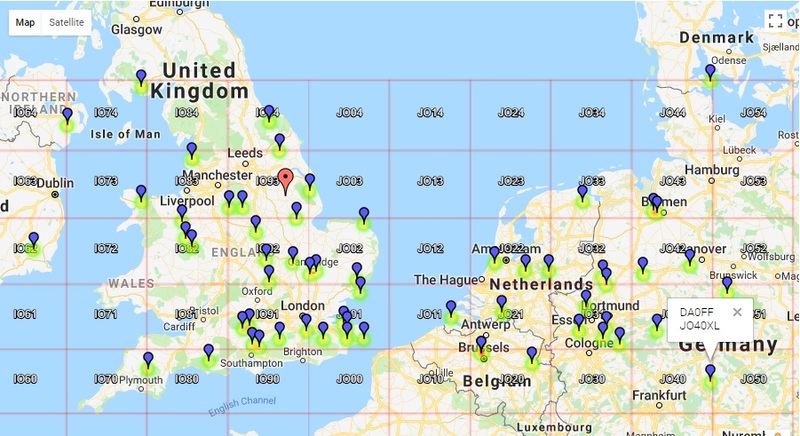 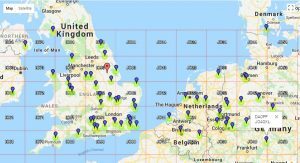 Conditions on the bands were still quiet with mainly UK stations on 80m with one or two further afield on 40m. 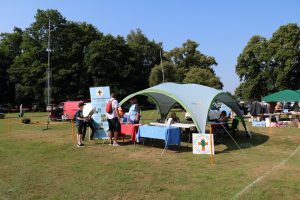 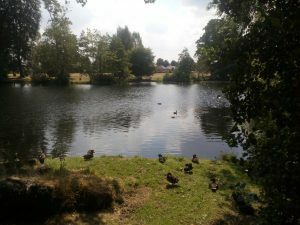 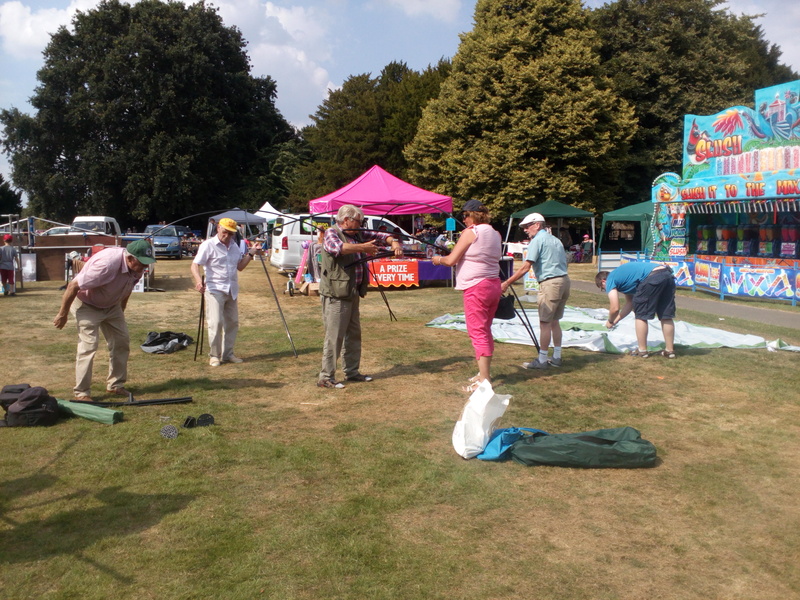 With the weather being better the other stall holders returned and so did the public. More people come to ask questions and see what was involved. As the winds picked up it was soon just Stephen, Les and Steve remaining but when Steve had to head off for other reasons Les and Stephen decided it was time to pack up and head home. 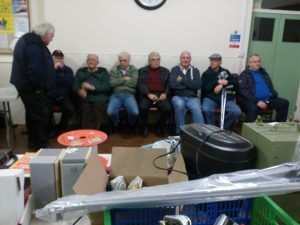 The LSWC will be back at FirPark with some potential improvements to the station there being worked on next year. 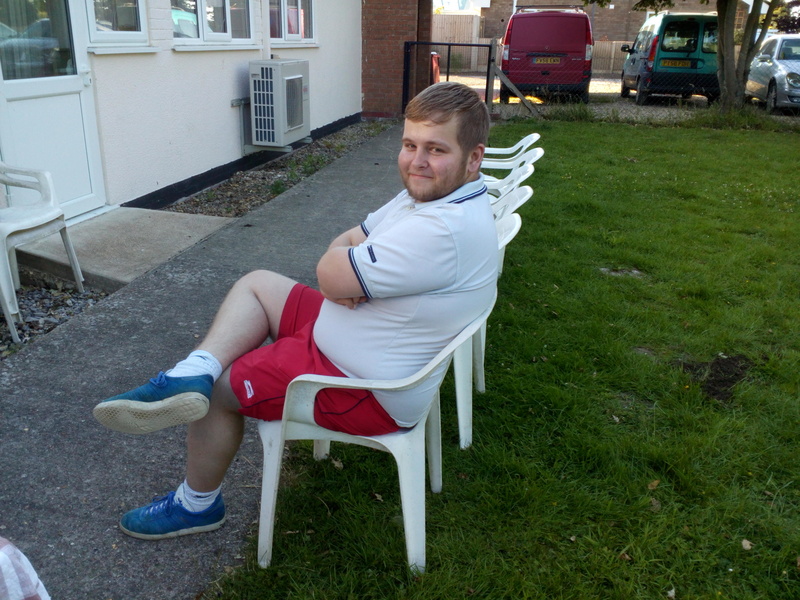 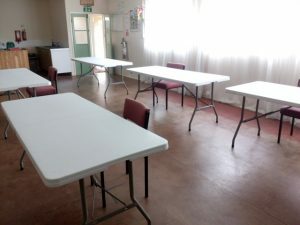 After the excitement of our aborted foundation exam on the 28th July everything went almost smoothly this morning; the taxi didn’t turn up for Lyon and Liz and they had to get a lift from a neighbour, they arrived at the village hall at 11 minutes to 10 with the exam starting at 10!! 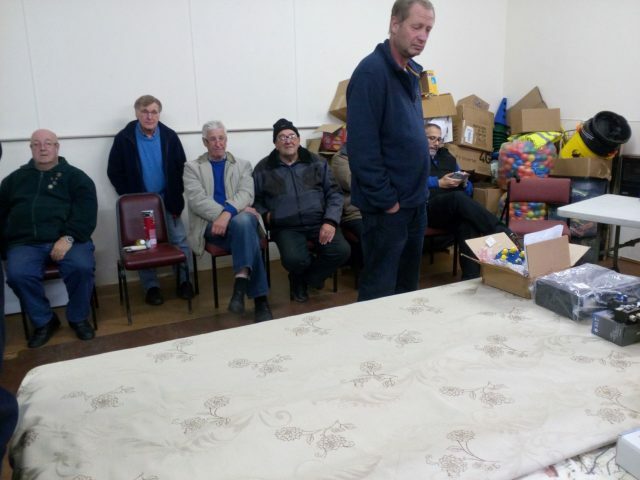 The village hall set out exactly as I had indicated on the exam layout – plenty of room between candidates. Thanks Peter, Les and David, supervised by Celia; if I’ve missed anyone sorry. The successful candidates; back row l to r Andy, David and Mick, front Lyon. 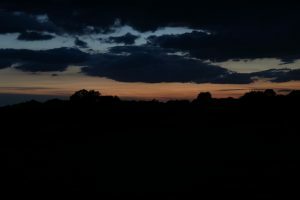 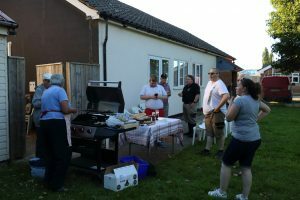 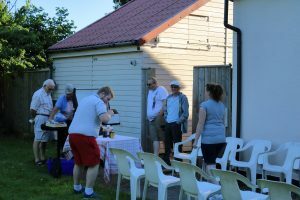 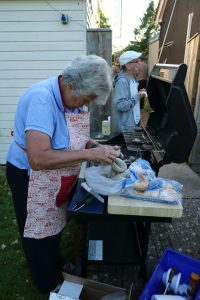 This Wednesday, 27th, saw the LSWC host another BBQ night. 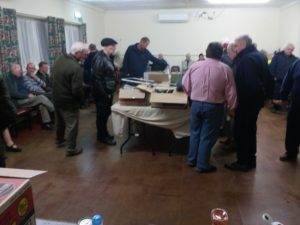 These are usually well attended and enjoyed by our members. 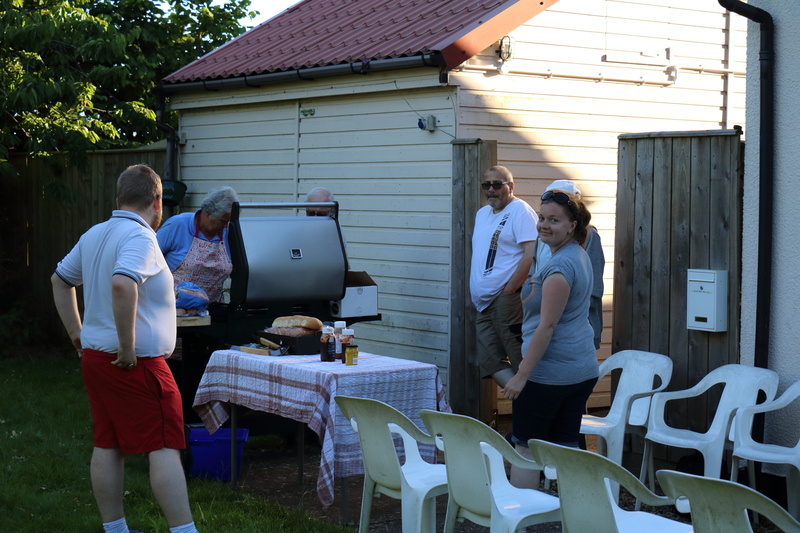 With Members arriving the BBQ was fired up and out came the burgers and sausages. 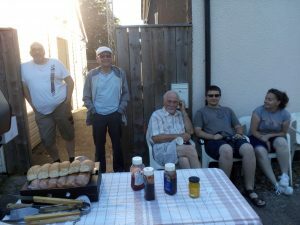 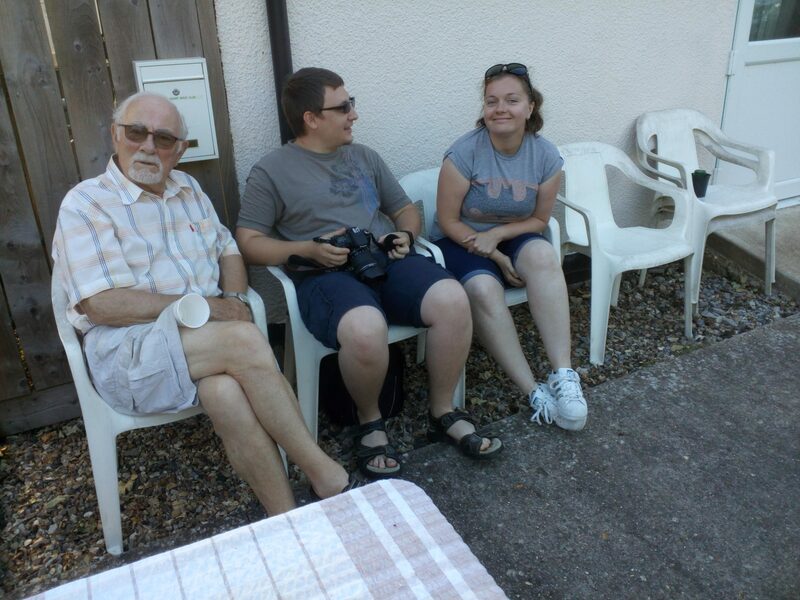 We again must thank Pam, G4STO, for getting the food for the evening event and as always it was well enjoyed all round. I for one, was rather full up by the time all was eaten up. Especially when all the sausages and burgers were gone out came a selection of cakes for pudding. 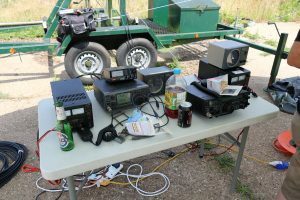 With a cooling breeze and the sun setting a select few remained outside to make the most of the good weather with others in the shack operating between servings. 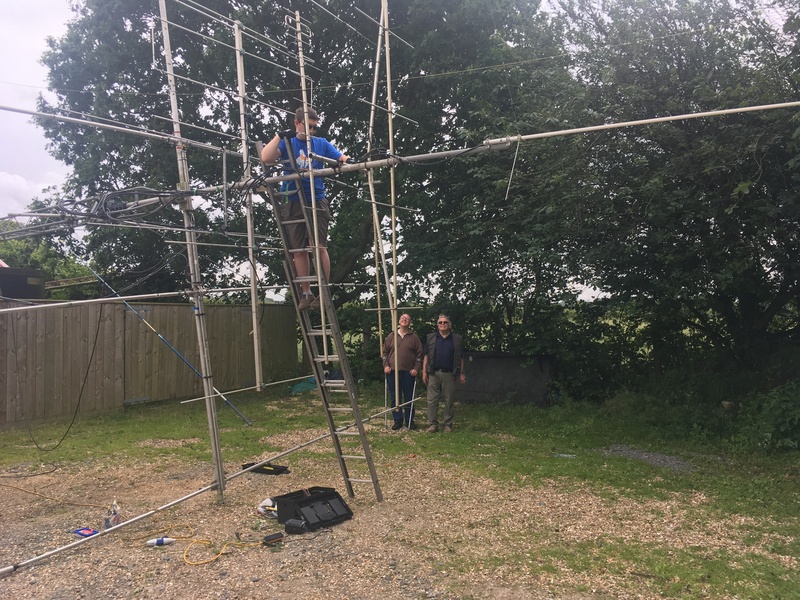 This weekend members undertook more work on the clubs antennas. 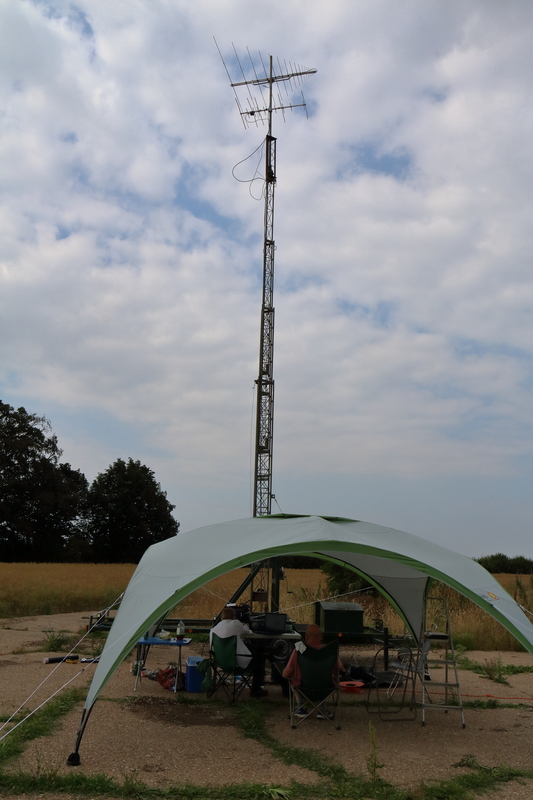 After the work done previously installing the HB9CV, when the mast was put back up it was found to have a high SWR. The coax used was an existing run that was previously used for 23cm which was taken down that same day with suspected antenna problems. 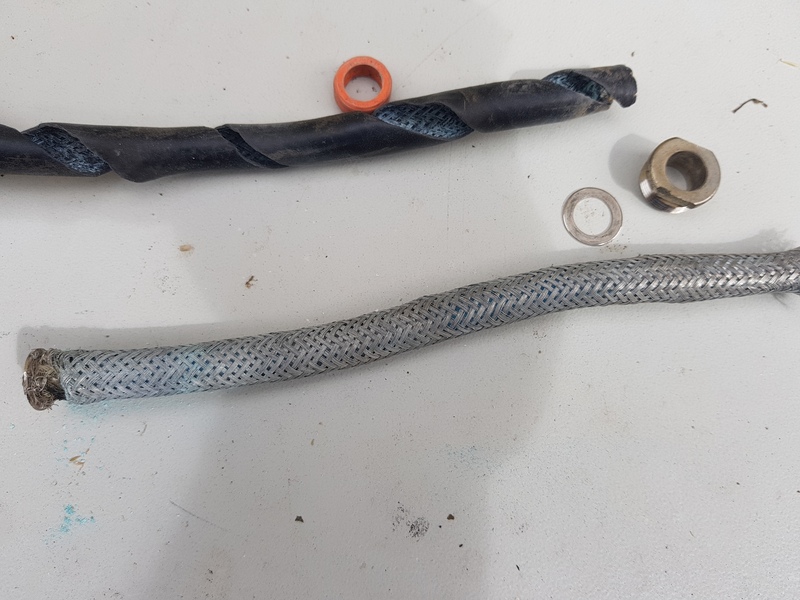 With this coax now being used to feed the HB9CV which was also showing a high SWR the coax was now also suspected as faulty. 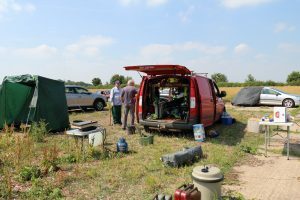 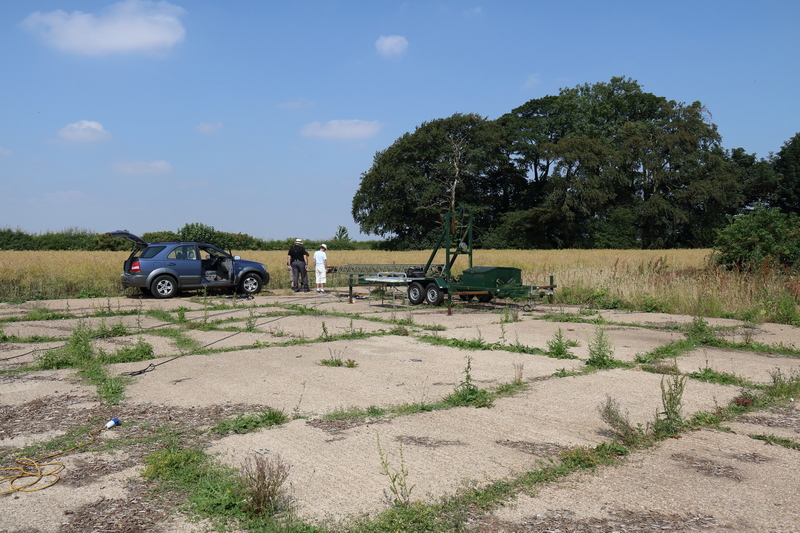 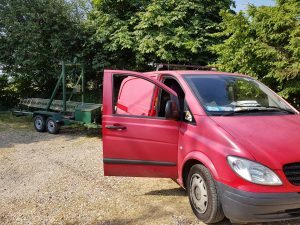 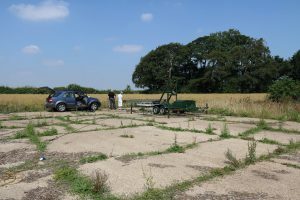 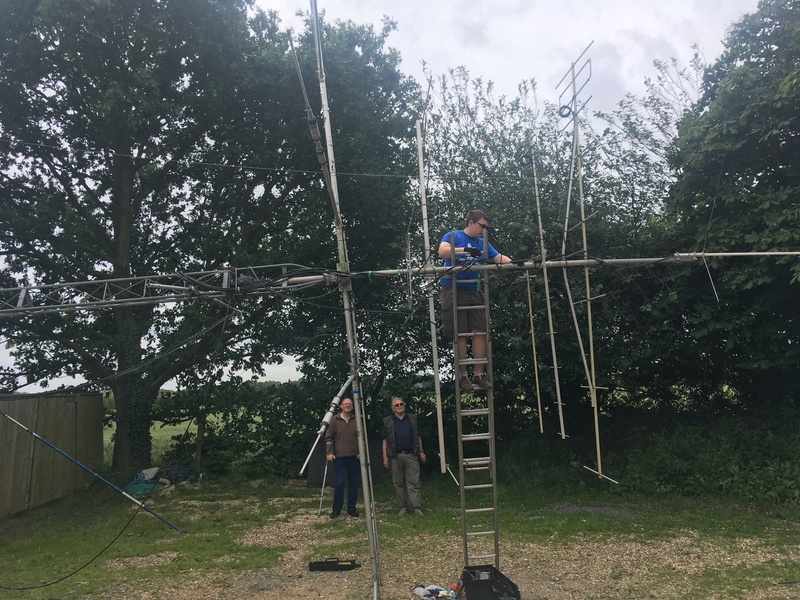 Stephen (2E0SSM), Les G1LQB, Peter (2E0FGA), Roger (G3PVU) & Steve (M5ZZZ) arrived on site Saturday morning and soon had the mast lowered. 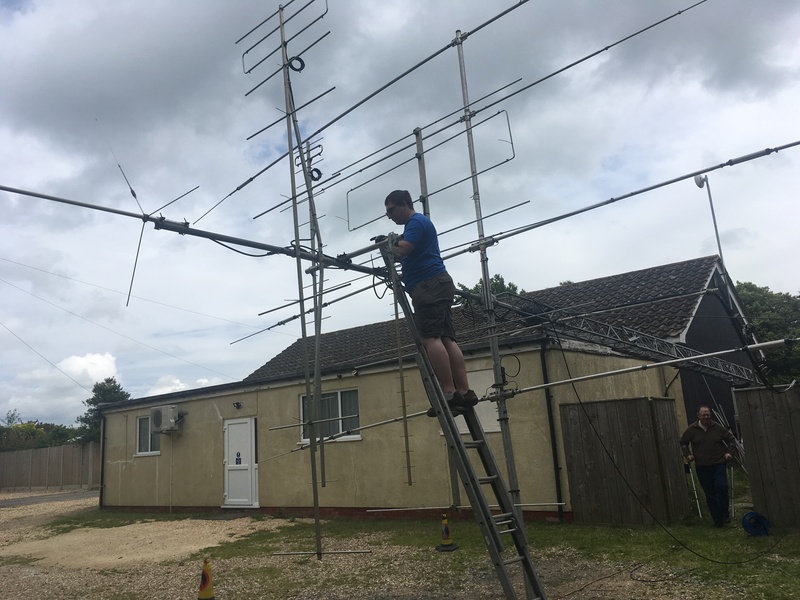 With the mast now down again a new run of coax was installed and connected to the HB9CV. 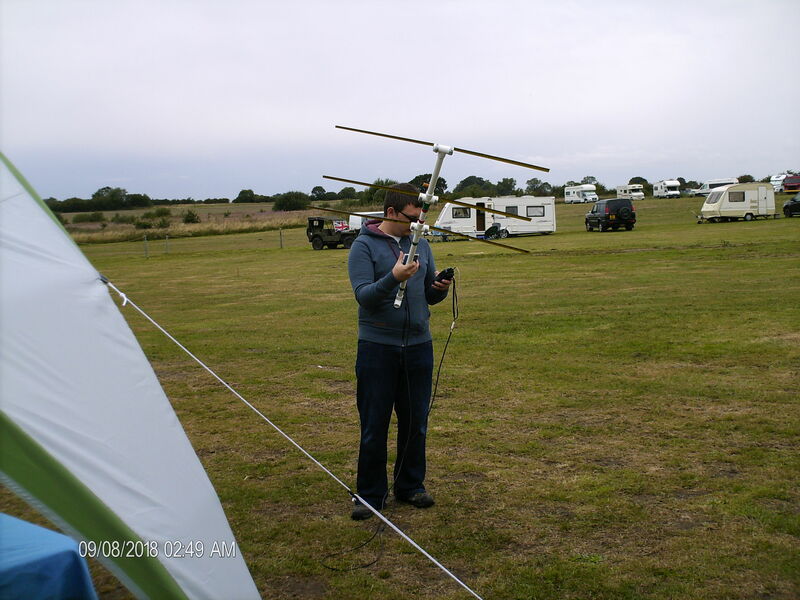 The spacing between each of the antennas was also improved. With this done it was decided to remove the connector from the end of the suspected 23cm coax to check for water ingress. 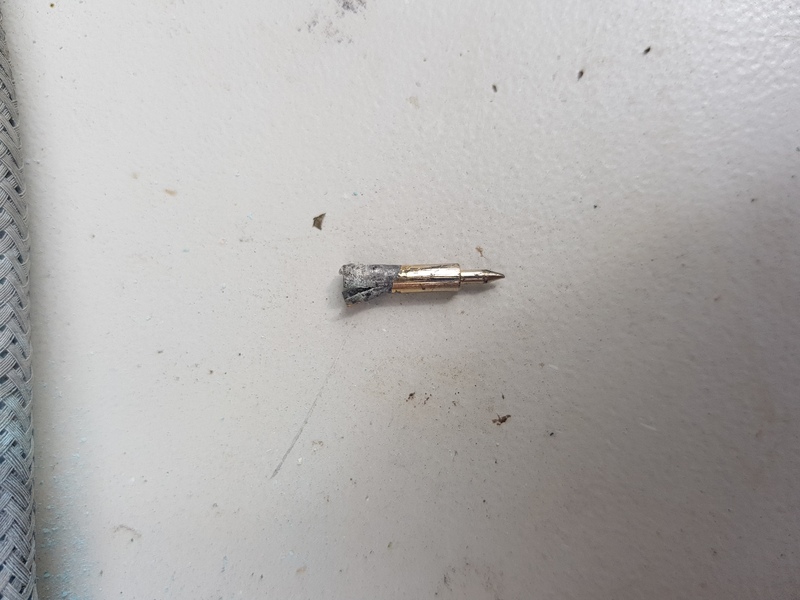 What was found was as predicted, water had got into the coax and had started to corrode the braid, center core and the pin of the N-type connector. 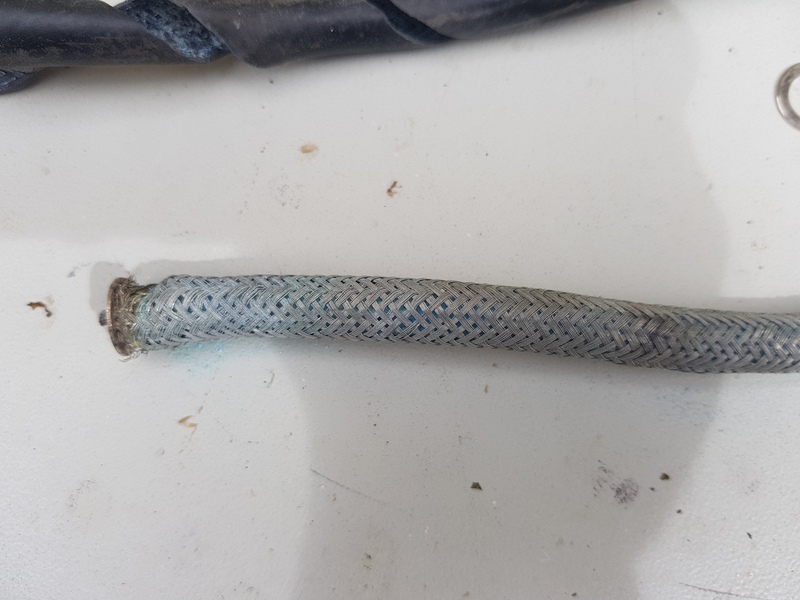 About 2ft was cut off the end to try and find some ‘good’ coax. 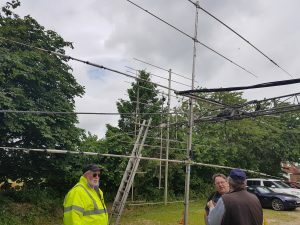 A new connector was fitted, The 23cm antenna refitted with a second hand dipole and the mast was lifted back up. Both the antennas were tested, the HB9CV worked perfectly and its front to back performance demonstrated with an S9 signal completely gone when turned even 90 degrees away. 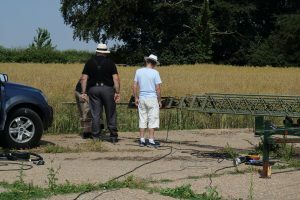 The 23cm unfortunately still didn’t work and so further investigation is required. 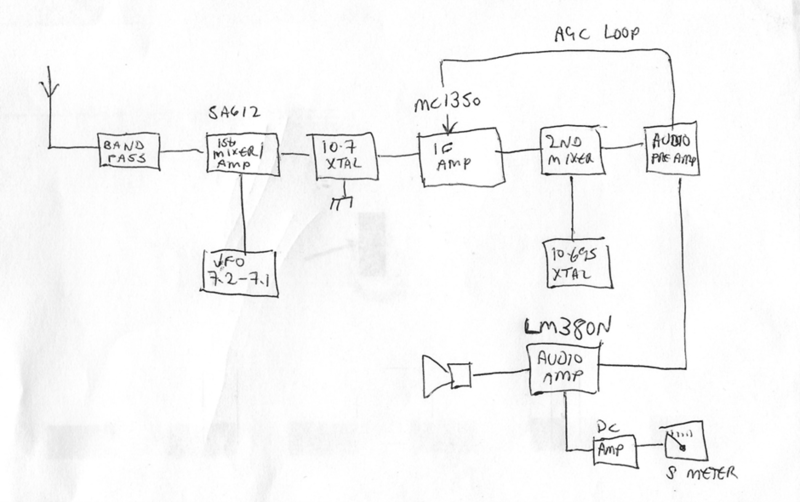 Next plan it to test the full length of coax with a dummy load to see if it all needs to be replaced.